Summer Reading Program Revamped-So Far So Good! Part of being a librarian means the ability to be flexible and spontaneous. When I got to work on Wednesday (which was Batman Day) I was told that we had been getting calls about a Batman Day at the Library celebration we were hosting on Saturday. Turns out we were advertised on the DC Comics Blog as a location hosting a Batman celebration on Saturday. (I think this occurred when I requested some promotional Batman items, but I'm not exactly sure) All I know is that we were given three days to plan an unexpected program. Luckily, I work with an amazing team (and a wonderfully nerdy team!) of people so we threw together an amazing program. Planning a program in just a few days took a lot of brainstorming and Batman research. But I'm amazingly lucky to work with a great group of people who all jumped on board and helped out. Everyone took on a task, worked together, and created a pretty incredible program that was a lot of fun. We tried to keep the activities simple and fun and stuck to a lot of basics like trivia, games, and crafts. -Screenings of Batman The Animated Series. According to my husband, who is a big Batman fan, this series is the best of the animated series and might be the best incarnation of Batman on screen, so we knew it would be a hit as part of our party. -Scavenger Hunt-my amazing staff pulled together to create some amazing scavenger hunts around the library (and these sneakily taught our kids all about the library!) One scavenger hunt included riddles from the Riddler that needed to be solved. The riddles were clues to the locations of the question marks around the library. The other scavenger hunt was a hunt down the villains around the library. We printed off pictures of the characters and hung them around the library for the kids to find. -Bat Villain shooting gallery. My awesome staff put this together as well and created a shooting gallery using nerf guns, styrofoam blocks, and pictures of various bat villains. This was recycled from our Star Wars program and worked well with Batman too. It was a huge hit and the kids loved it. It was also fun for the younger kids who couldn't do the scavenger hunt or trivia. -Batarang Toss-Using the diecut machine, we cut out dies and my staff created black and yellow boxes for the kids to toss bats into. Another good activity for the younger kids. -Build Gotham City-I couldn't have done this without my staff who again, pulled together to cover wooden blocks in black paper to create Gotham City building blocks. This was another option for the younger kids. -A Batman Fan Discussion-my husband led this discussion for teens and adults about all things Batman-the best actor to portray Batman, best Bat Villain, best movie/TV Show, thoughts on the upcoming movie and Gotham TV Show, and various Batman theories. -Lots of freebies and goodies! Thanks to our local comic book store and Random House, we were able to give away lots of great posters, Batman masks, buttons, tattoos, and comics. Why yes, I actually get paid to dress up and pose with Batman! My job is awesome! And of course, the highlight of the program was having Batman at the library! I am very lucky that I was able to meet our local Batman. We have the most amazing guy in town that dresses up as Batman and makes appearances and I was able to book him for the morning to come take photos with the kids. It was a huge hit and the kids were in awe of him. The best was seeing the kids dressed up and being amazed that their favorite superhero was right in front of them! And I got to promote the library to Batman which was pretty awesome! We decorated the room with diecut bats and I cut out a skyline of Gotham City from a tri-fold science board that I had painted black with yellow windows. One of my amazing co-workers created a Bat Signal using a projector and Powerpoint that we projected onto the ceiling. I also used print outs of a Bat Signal on the floor to lead patrons down the concourse and around the corner to where the event was and where Batman was located for photos. Seeing a video of a previous Batman appearance, I made sure to have a barricade up to keep a line for photos going smoothly. 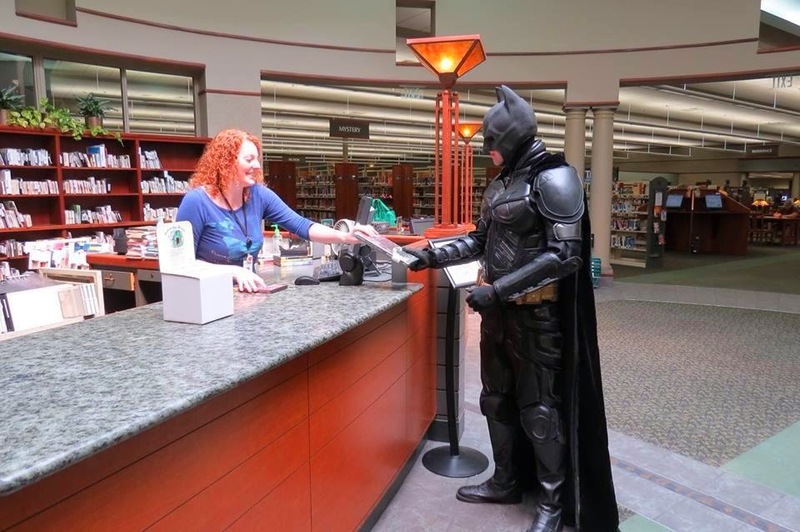 We promoted the program through our media channels, distributed fliers to local comic book stores, promoted in on library Facebook pages (and got coverage on Batman's page too!) as well as being advertised on our area visitor's bereau blog and on DC Comics blogs. For putting together a three day program, all of my staff and awesome co-workers came together wonderfully and helped spread the word. We ended up having over 100 people at the event, which was pretty impressive for doing something on such short notice! Overall the program was incredibly well attended and well received. We had plenty of activities, but if we did it again, I would like to book a larger room, since we were in our smaller Story Hour Room. This way everything could be more spread out. All the activities ran themselves really well so staff didn't have to do much but mingle, restock supplies and hand out prizes. 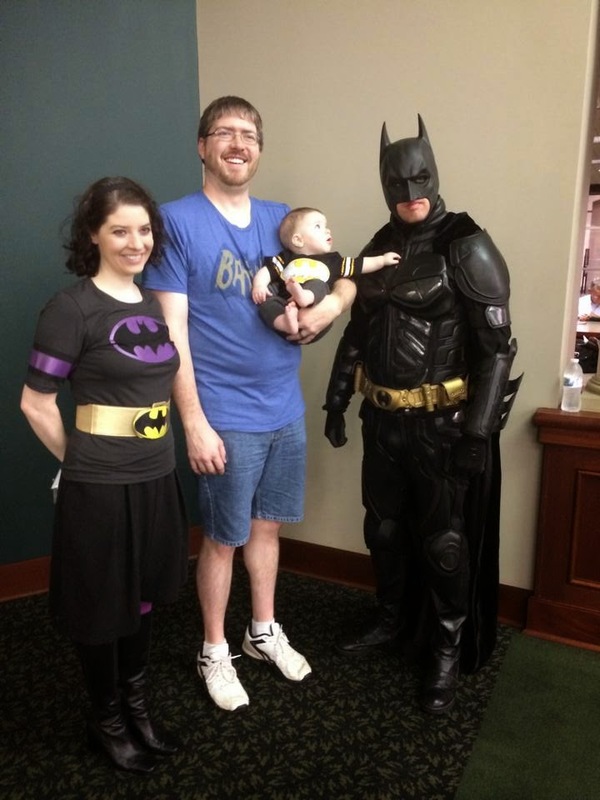 It was a great success and I can't wait to host another Batman Day at the Library! Now that's what I call unprogramming. 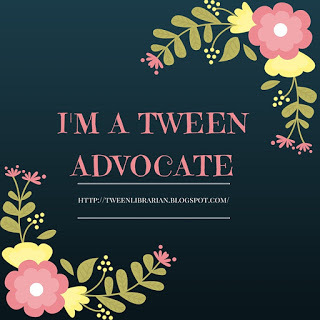 Gonna share on this month's Thrive Thursday round up? Amy at Show Me Librarian is hosting! Printing this whole post to put in my summer reading file for next year! That sounds like an amazing day, but even more amazing that you got it together in three days! Nice job with the programming and flexibility! I'm going to save this for next year! Very very true about the animated series! My husband is constantly watching that. Your scavenger hunt idea definitely got my wheels turning about one I need to write-- thanks!